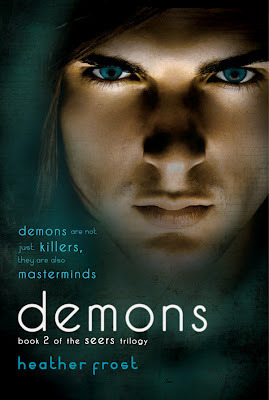 Today I am excited to be taking part in the Demons (The Seers Trilogy) blog tour! In honor of the book's September 11th release, Heather is doing an all out, blow out tour! I recently discovered Heather Frosts Seers series when offered the book as an ARC through Net Galley. I have to say I am totally in love with it! Demons is the second book in the Seers trilogy and I can honestly say there is absolutely no disappointment in this series at all. It is like nothing you have ever read! Let's learn a little more about the book, shall we? 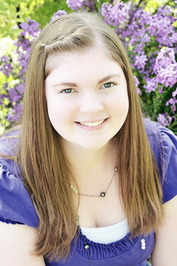 I am honored to have Heather on my blog today for an interview! Read on and enjoy! I was born in Sandy, Utah, a few days before Halloween in 1989. I lived in Salt Lake City until I was about six, and then I moved North and settled into the place I still call home. I'm the second child of ten, and I absolutely love being the big sister. I can't remember a time when I didn't enjoy reading, and I did a lot of it. I also dabbled in writing when I was young, though nothing serious until I entered the teenage years. Becoming an author is a dream come true! I attended Snow College, and there got the best job ever as a writing tutor. I graduated in May 2011 with my Associate of Science, and am currently pursuing a Bachelor of Science as an English Major. I love movies, music, and books—although I do think that the dumbest question on the planet is the whole “What's your favorite book/music/movie?” The best answer I've come up with is, “Whatever I'm reading, listening to, or watching at the time.” Generally, it's an accurate answer. I love the smell of lilacs, wet cement, and freshly cut grass. I love brownies, rain, and curling up with a good book. Let's see what Heather had to say to me! When I was really little, I thought I might want to be a nurse, or a school teacher. But honestly, I’ve always dreamed of becoming an author. 3. Do you have a schedule of when you write? Not as such. I can write any time of day, though I usually write at night because I have classes and work throughout the morning and day. 4. How are you able to balance other aspects of your life with your writing? It’s tricky. I definitely get more writing done when I’m not in school, so I’m excited for graduation in the spring. Prioritizing is super important, and luckily I’ve been learning to delegate a lot when it comes to marketing my books. 5. What was the hardest thing about writing a book? The hardest part for me is the editing. And can I narrow that down to the final editing? By the time you’re ready to declare a book “finished” and send it into a publisher, you’ve read your story WAY too many times. 6. How many books have you written so far? Do you have a favorite? I’ve finished thirteen novels, so far—and have about thirty others somewhere between started and almost finished. Each book I’ve written has a special place in my heart. 7. Where do you write? I prefer writing in my bedroom. It’s sort of my “spot”, where I can really tune out the world and just focus on my characters. 8. When deciding on how to publish, what directed you to the route you took? There are SO many different ways to publish, each with pros and cons. I researched a lot of different ways to go about publishing, and finally settled on the one that fit with my personal writing goals. 9. Have you gotten feedback from family about your book(s)? What do they think? My sister was always my first critic growing up, and my parents have always been especially supportive of my writing. As for specific feedback on the Seers Trilogy… Mom loves it way more than my older stuff, mostly because she’s not as into the fantasy that entails castles, swords, magic, and thieves. My sister prefers my older stuff to Seers, mostly because she’s a huge fan of the castles, swords, magic, and thieves. I’ve got a brother who hasn’t read the books at all, and another brother that wants to go out and write his own books now. (He’s six, and absolutely adorable about it!) I’ve got a sister that’s mostly interested in acting the part of Lee, if Seers ever goes to the big screen, but she prefers reading Twilight. Basically, they’re all very supportive of me, even if they don’t all name Seers as their favorite book. 10. What kinds of things do you like to do outside of writing? I love watching movies. I’m sort of a fanatic, actually. I also enjoy playing the flute, hanging out with my family and friends, reading, and collecting key chains. I recently acquired a really cute blue converse shoe! 11. What kinds of advice would you give to someone who wants to start writing? Read, first of all. You need to know what’s out there. Secondly, believe in yourself enough to start. That goes along with the third bit of advice: just write. Don’t worry if you haven’t mapped out every part of the story, just start writing. 12. What is your favorite book? favorite author? Do you have an author that inspired/inspires you to write? Favorite book? Impossible to answer. I love classics, (Jane Eyre, The Scarlet Pimpernel) and I love newer stuff as well, (Percy Jackson, Matched, The Looking Glass Wars, Harry Potter.) J.K. Rowling was very influential, as was Charlotte Bronte, David Eddings, and even Lisa Mangum. Basically, every book I’ve read has managed to teach me something about writing, and many have inspired me to write the way I do today. 13. Do you have any go to people when writing a book that help you with your story lines as well as editing, beta reading and such? My sister and mom, as I mentioned before, are splendid to help me out. I also have several trusted friends that serve as beta readers. So I definitely have a support system! 14. Are you working on anything now? I’m working on polishing Guardians, the third book in the Seers Trilogy, and I have a few other books I’m also working on. Mostly fantasy! Thanks so much for answering all my questions, Heather, it was a pleasure to have you here on my blog! And now, for my review!!!! I received this book as an ARC from Net Galley to read and provide an honest review. STOP! If you have not read the first book in this series, you will not understand this book at all. So, turn around, go back, get the first one and READ IT! Because you will not be disappointed! Kate is not a normal teenager; she's a seer. She can see auras and she knows what people are feeling because of this. This also means she can tell the difference between Guardians and Demons. And her boyfriend, Patrick, he's far from "normal." He's immortal, and he's her protector. In this sequel to Seers (Seers #1), Kate and Patrick are on a mission to find out why Kate is the focus of the Demon Lord. And what they find is, well, not what they might expect at all. Let's start with the cover, I love it. It so portrays Patrick, who is really the ultimate focus of this book. And once you read this book, you totally understand why the cover HAD to be this way. I love the blue color. However, this cover could be someone else, who will remain nameless so as not to spoil it! The characters continue to be well developed and I really connected to them, wanting to go through the story with them. Certainly, the love between Kate and Patrick grows and blossoms into a real relationship. They go through a lot together in this book and that just serves to help solidify their relationship, making it even stronger. Kate is strong, even stronger than in the first book. And she's very determined, sometimes to her own detriment. I still love Toni and he remains my favorite character by far. He's funny and to the point. Nothing gets by him. He's snarky and smart and he totally steals the show! And Lee remains the ever present loyal friend. The extraneous characters kept me on my toes for sure. I also meet a few new characters in this book: Demons, the Demon Lord, and some new Seers. And people I didn't expect to have any abilities or even be present popped up and surprised me. The storyline of this book is really great. It takes the Demon/Guardian/Seer relationship even further than I thought possible. There are so many plot twists and turns, I was not sure where I would end up, which kept me wanting to read to find out what happens. I do have to say the first half of the book is a little slower than I would have liked. There was a definite need for the build up, I just feel things were a bit repeated. And, while I understand having to recap the prior book a bit so people can remember what happened, I think it was a bit overdone. It took me longer to read this book than the first because of these facts. However, the book did tug on my emotions and captured my heart. I found myself crying many times, which I was not expecting at all. And of course I was laughing, as well, which certainly served to balance out everything that was happening. There is a ton of depth to this book which I was not expecting. The end certainly left me with a cliff hanger. It was intense and left me wanting the third book NOW. As with the first book, I loved Heather's writing style. She certainly does not write like an author who is newly published. Her descriptions and clean, crisp and precise. Frost writes realistic characters. And there are many jaw dropping moments that have you wondering where the plot will even lead or if it can go anywhere at all. Frost helped me connect with this book in ways I did not think possible. This series is definitely on it's way to becoming one of my all time favorites! Awesome job Ms. Frost! 4 out of 5 stars from me. And you can visit these sites over the next few days to follow the rest of the blog tour!